According to a new patent, Nintendo may not be done with the world of 3D gaming just yet. As you may know, Nintendo has a long history with 3D gaming and trying to pass the craze onto consumers. Starting with The Virtual Boy, and most recently giving it a whirl with the Nintendo 3DS (the latter much more successfully done than the former). Nintendo just doesn't seem to want to let the concept of 3D gaming go. And it looks like that may not be changing anytime soon. 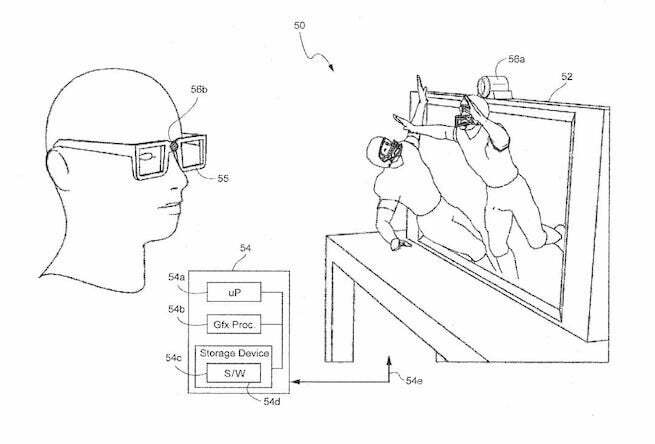 Recently, Nintendo filed for a new patent with the United States Patent and Trademark Office that reveals it's still researching in the field of 3D gaming. The patent in question involves some type of new eye tracking technology that involves a small camera affixed to your television. Via the device, a game would be able to create an illusion that there's depth that actually isn't there. According to one form of the patent, this can be down without 3D glasses, but there is another patent that utilizes the eyewear. Unlike the 3D produced by the 3DS, the stereoscopic effect of this new technology would create the optical illusion via image rendering, and should also create a more convincing "3D." Of course, like many patents, this may not ever leave the research room, or possibly won't manifest into anything for quite some time. Patents are often filed and nothing ever comes of them. However, what this does cement is that Nintendo isn't done toying around with 3D gaming, and that such features could come to the Nintendo Switch or another Nintendo gaming product beyond. Who knows. All we can do is speculate, but if you're a fan of 3D gaming and its potential, this is exciting news. Because if there is one games maker that will keep 3D alive, it would be Nintendo. Anyway, as always feel free to leave a comment letting us know what you think. Should Nintendo continue to push 3D gaming? Should the Nintendo Switch be bolstered with it? Or should Nintendo worry about games and hardware iterations right now?